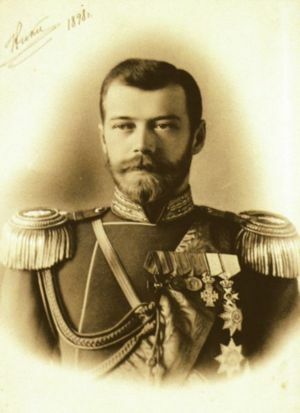 Nicholas II (1868 – 1918) was the last Czar of Russia. In March of 1917 he was forced to abdicate and was thereafter placed under house arrest with his family. The Bolsheviks came to power in Russia in October 1917 and the royal family was executed on 16 July 1918 along with their physician and three servants. Czar Nicholas and his family were canonized by the Eastern Orthodox Church in 1981. Also commemorated are those who faithfully served them: General Elias Tatishchev; Prince Basil Dolgorukov; the physician Eugene Dotkin; the lady-in-waiting Countess Anastasia Hendrikova; the serving-maid Anna Demidova; the cook John Kharitonov; and the sailors Clement Nagorny and John Sednev. Their Feast Day is July 4th. During his reign, Nicholas continued the attempt to industrialize Russia. His regime built the Trans-Siberian Railroad. From 1907–1914, Russia was the world's fastest-growing economy. Nicholas II was badly smeared by Soviet propaganda. After the 1896 coronation stampede, Czar Nicholas II visited the victims in the hospitals and compensated them as shown by photographic evidence. When absent from St. Petersburg during the preplanned Bloody Sundays when the demonstrators fired first, only a total of 130 from both sides were killed. Nicholas II wrote in his diary, "A heavy day! In Petersburg, there were serious disorders as a result of the workers' desire to reach the Winter Palace. The guard had to shoot in various areas of the city, and there were many killed and wounded. Lord, how painful and heavy!" As a strong Christian who showed love for his enemies, he even compensated the families affected. The Russo-Japanese War which he tried to stop was staged behind the scenes, and like Kaiser Wilhelm II, did not have any real military experience as his father Czar Alexander III did not fight a single war during his thirteen years in power. Czarina Alexandra and her sister Elizabeth hated Prussianism so much that they distanced themselves from the German culture that they saw as decadent. The British claimed that they would help the Romanovs escape the revolution, but it turned out to be a betrayal. Grigori Rasputin was not an official or even a church member, but a member of a sect that engaged in occult practices and sexual immorality called Khlysty. Pierre Gillard, a Swiss national who tutored French to Alexei, discussed this in his memoir Thirteen Years at the Russian Court. He made clear that Nicholas, who sent the police on his trail many times, did not actually trust the man or let him exercise much influence; Alexandra, a concerned mother whose hemophilic son was injured, wrote to Rasputin like she did everyone else, which should thereby dispel rumors of love affairs, started out as hostile to Rasputin's former friend Theophan of Poltova, but later realized that she was deceived. This page was last modified on 27 March 2019, at 21:52.